Granada is a truly lovely city. One of those places you think you would like to live. It is small - about 300,000 people - but with enough café-loving locals, tourists and students to mean there's plenty going on. The city sits in a dramatic setting, with the steep, dry, rocky Sierra Nevada mountains on one side and agricultural plains on the other. The centre is beautiful, reflecting an interesting history involving Arab Muslim roots, Catholic Spanish conquerors and early gypsy and Jewish immigrants. It still retains lots of Moorish influences in the architecture, the decoration of the buildings, the food and the music. Your bog-standard post office or Government department might well have some fine mosaic tile work around the walls or the staircases. Or a little key-shaped doorway. And the influence of the gypsies, who arrived in Granada about 600 years ago and settled in caves in what is now the Sacromonte area of the city, is seen in the preponderance of Flamenco dance halls, often in souped-up versions of the original caves. Granada is dominated by the Alhambra, a fortress/palace/city/garden complex built strategically on the steep slopes above the city, and visible from practically everywhere. Until they were ousted by the Spanish monarchs, the Alhambra was the court of the Nasrid Sultans, and it was a city within a city; inside its walls are palaces, mosques/churches, baths, gardens, fountains and halls, as well as houses for soldiers, artisans and others. These days there are also lots of tourists. According to the useful GranadaInfo website, run by my former school friend Sarah and her husband John, the Alhambra is Spain's most visited monument, with an average of 8,500 people heading there each day. 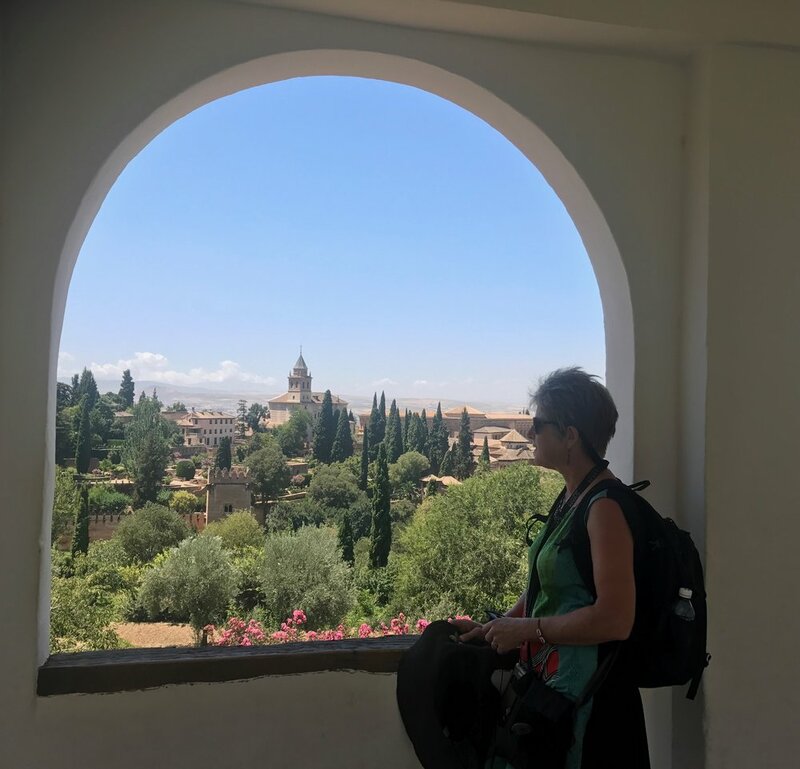 The buildings within the Alhambra tend to look plain and austere from the outside, but inside are amazing, with lace-like latticework windows, mosaic tiled walls, finely carved wooden doors and masses of exquisite plasterwork decoration. Totally beautiful. The Alhambra has a turbulent history, having been built by a succession of Nasrid Sultans from 1237 onward, but then taken over by the Spanish monarchs Isabel I and Fernando II in 1492. At that stage the "become-Catholic-or-die" techniques of the Spanish inquisition (which went on for an astonishing 350 years in Spain, from 1478 to 1834) were much in evidence. In Granada. Muslims and Jews fled, converted, or were tortured and killed. Mosques all over the city were destroyed or converted into churches. Then in the early nineteenth century, Granada was overrun by Napoleon's troops, as part of the French occupation of Spain. As they left they blew up a couple of the towers in the Alhambra. Just because they could. We spent pretty much one whole day at the Alhambra - it was just gorgeous. And views of the complex from the rest of the city, particularly the hilly Albaicín area across the valley (and vice versa - views of the city from the Alhambra), make Granada a great place. When you aren't visiting the Alhambra, or going sightseeing on a Segway (see previous blog), there are a plethora of pavement cafes, tapas bars and restaurants of every hue. The Spanish go out late, often emerging for dinner or a drink and an evening stroll at 9pm or 10pm - a time when Anglosaxons might be pondering cocoa and bed. And in Granada (and perhaps elsewhere in Spain; I am far from an expert), when you order a beer or a glass of wine in a bar, it automatically comes with a small bowl of tapas - an aubergine dish, for example, or a plate of roast potatoes, pasta, chorizo, olives, crisps etc. It's a very civilised way to relax.